United We Stand … For Israel? The 2012 presidential and congressional elections have left in their wake divided government, acrimony and a sad push for political advantage over practicality or national needs. Democrats and Republicans are arguing over the “fiscal cliff,” the looming deadline by which the country’s legislators must reach an agreement for deficit reduction targets or face huge automatic budget cuts, hearings about the death of U.S. diplomat Chris Stevens in Benghazi, Libya and other issues with virtually no agreement between the parties. Yet Republicans and Democrats seem to agree that Israel’s assault on the virtually defenseless Palestinians in Gaza is justified as hundreds of civilians including children have died. Palestinians pull the body of a child from under the rubble of the Daloo family house following an Israeli airstrike in Gaza City, Nov. 18. Palestinian medical officials say at least 10 civilians, including women and young children, have been killed in Israeli airstrikes in Gaza City. Once again the political leaders in the United States are backing Israel and a policy roundly condemned around the world and even in domestic protests. While President Obama insists Israel has the right to defend itself from rockets fired by Hamas in Gaza, he fails to talk about daily assaults on Palestinians in what has been likened to an open air prison. “In January, Israel will be holding elections, and some have suggested that the assassination and airstrikes are a bid by Prime Minister Benjamin Netanyahu to galvanize his far right base,” noted Madre, an international women’s peace group. “The people of Gaza already live under a U.S.-supported Israeli military siege that denies them basic rights, like access to clean water and medical care. The current airstrikes not only risk civilian lives, they destroy essential infrastructure in Gaza still not rebuilt from the last Israeli offensive four years ago,” said the group. It called for an end to Israel’s assault and an end to Hamas rocket firings. It also noted Israel’s targeted killing of Hamas leader Ahmed Jabari violated international law against assassination, and according to one report came as he was reviewing a draft document for peace with Israel. Robert Fisk of the Guardian wrote, “The killing of Mr. Jabari was a ‘targeted attack,’ it was a ‘surgical air strike’—like the Israeli ‘surgical air strikes’ which killed almost 17,000 civilians in Lebanon in 1982, the 1,200 Lebanese, most of them civilians, in 2006, or the 1,300 Palestinians, most of them civilians, in Gaza in 2008-9, or the pregnant woman and the baby who were killed by the ‘surgical air strikes’ in Gaza last week—and the 11 civilians killed in one Gaza house yesterday.” He was critical of both Israelis and Hamas, and media coverage. 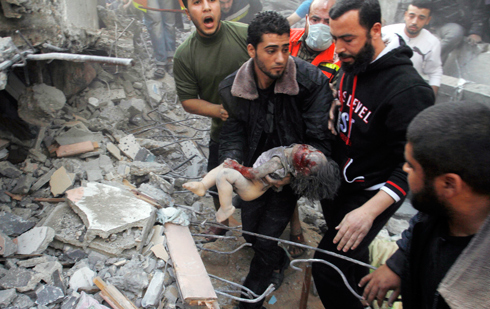 “The new exchange rate in Gaza for Palestinian and Israeli deaths has reached 16:1. It will rise, of course. The exchange rate in 2008-9 was 100:1,” he noted. “Israel is our main ally in the Middle East. Israel has the absolute right to defend itself. All of us, Republicans and Democrats, should stand with the president in supporting Israel … I think Israel should do whatever it has to do to defend itself,” Rep. Peter King of New York said at an interview with ABC. It was essentially an unheard of agreement with the president on an issue—Israel. At Final Call press time, the Israeli assault had lasted six days and Israeli defense forces were massed on the border of Gaza for a possible ground invasion. “Israeli forces openly targeted residential areas and homes of Hamas activists into Monday, and continued targeting media centers in Gaza City—making it increasingly difficult to report ongoing Israeli war crimes,” reported Common Dreams.org on Nov. 19. A building used by media outlets including Britain’s Sky News, the Saudi-owned Al-Arabiya network, Russia Today and Iran’s Press TV, was struck again Nov. 18, reportedly killing a senior Islamic Jihad official, Common Dreams reported. Meanwhile Palestinian factions Fatah and Hamas announced they had ended their rivalry and come together, symbolically unifying the West Bank and Gaza for the first time in years. Egyptians were crossing into the Gaza Strip to show solidarity with Palestinians as Egypt officials were working to forge an Israel-Gaza ceasefire with assistance from Turkey and Qatar. Support for Israel is waning with protestors at home and abroad deploring the military attacks as political leaders stand strong with the Zionist nation. “As American citizens, we are horrified that our taxpayer dollars are funding the military equipment used by Israel to demolish Palestinian homes, like the one Rachel Corrie died defending, and the destruction that is being wrought upon Gaza at this very moment. We call upon the State Department to condemn these unjust and inhumane actions, instead of continuing to let Israel act with impunity,” said Medea Benjamin of the anti-war group CODEPINK. The Center for Constitutional Rights, CODEPINK, the American-Arab Anti-Discrimination Committee, and the U.S. Campaign to End the Israeli Occupation delivered to the State Department more than 17,000 signatures and an open letter signed by over 50 U.S. organizations asking for an investigation of the death of Ms. Corrie and other cases of death or serious injury of Americans by the Israeli military since 2001. Ms. Corrie was protesting human rights violations in Palestine when she was killed by an Israeli military bulldozer. Venezuelan President Hugo Chavez condemned the assault as “savage,” saying “aggression” against Palestinians must stop. Meanwhile the Israelis insist Iran is involved in arming Hamas with rockets and provoking the Zionist state. And the U.S. once again stands as the major supporter of Israel bearing witness to the Honorable Minister Louis Farrakhan’s warning that lockstep American support of Israel is leading the country to its doom with politicians marching behind the drumbeat of a powerful pro-Israel lobby. Despite her own economic woes, America gives Israel some $3 billion a year in aid and a Republican congressional leader warned Egypt to be careful how it handled Israel given that Egypt wants aid from America. In messages earlier this year and in October, Min. Farrakhan has warned against the inordinate influence Israel has over U.S. foreign policy and politicians. Last month, the Minister again cautioned against following Israel’s lead, in particular as the Zionist state seeks to make war with Iran. More people are becoming aware of wicked U.S.-Israeli actions, causing America and Israel to become isolated among the nations of the earth, he warned. As the world stands once again on the brink of all-out war, America has been warned and warned again about pursuing her current course. If she continues, her doom is sealed. That would be tragic for a nation that could have changed course, if it had heeded right guidance.